The demand for digital content has been increasing substantially due to the growth in Internet penetration across the globe. The demand for high-bandwidth applications is being driven by the increasing usage of smartphones to access the Internet. This has resulted in the development of ultra-fast broadband services. This global fiber optics market analysis report provides market segmentation by application (telecom, datacom, and others) and by region (the Americas, APAC, and EMEA). This report provides an in-depth analysis of the prominent factors influencing the market, including drivers, opportunities, trends, and industry-specific challenges. Of the two major applications, the telecom segment held the largest fiber optics market share in 2018, contributing to over 73% of the market. This application segment will dominate the global market throughout the forecast period. The APAC region held the largest share of the market in 2018, accounting for more than 57% share. It was followed by the Americas and EMEA respectively. 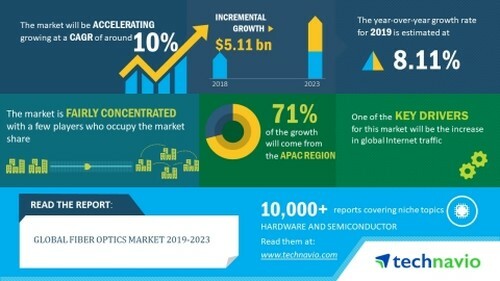 The APAC region is expected to dominate the market throughout the period 2019-2023.